HENDERSON, Nev. – The new year has officially begun, and that means New Year’s resolutions are at the front of people’s brains. One way to keep that resolution to get healthy in 2011 is to participate in the Fourth Annual Read & Run for Your Health 5K/1 Mile Walk hosted by Henderson Libraries. The event is hosted annually in support of a healthy community. The 5K/1 Mile Walk will take place at 7 a.m. Saturday, Feb. 19. And while the event does not require its participants to run while reading, it does promote running to benefit reading. Proceeds from the event will go toward purchasing health-related materials that will be made available for checkout at the various Henderson Libraries. Last year’s event raised $8,743. The family-oriented race is walker friendly and will begin and end at Henderson City Hall/the Henderson Events Center and Plaza – located at 200 S. Water St. Henderson – with the course looping through downtown Henderson and the Water Street District area. All participants will receive a race T-shirt, goodie bag and an official time. Awards will be given to the top three overall male and female winners in the 5K as well as the top three males and females in each age division. Registration is $25 until Friday, Feb. 11. From Saturday, Feb. 12, until Thursday, Feb. 17, the cost of registration increases to $30. On Feb. 18 and 19 (the day of the race), the cost is $35. 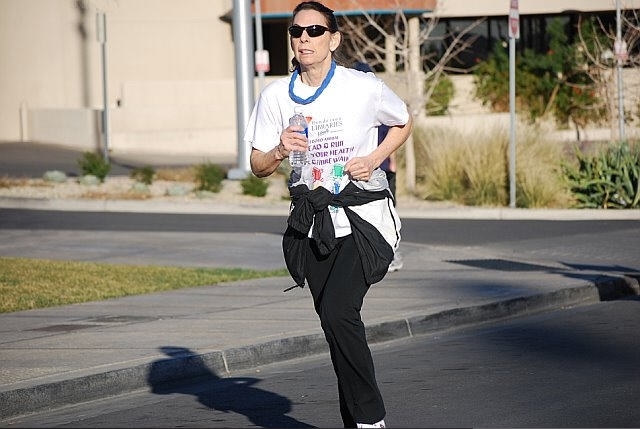 Registration can be completed at any of the Henderson Libraries’ six locations or online at http://www.mypubliclibrary.com/programs/5KRun2011.html. Sponsors of the Read & Run for Your Health 5K/1 Mile Walk include The Las Vegas Running Team, Las Vegas Wranglers and Estes Family. Sponsorship and volunteer opportunities are still available.